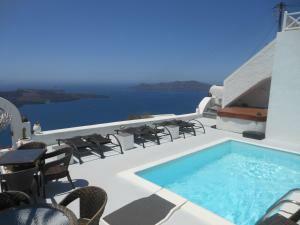 This typical Greek property is located in the hills of Firostefani, overlooking the Aegean Sea and the sunsets. 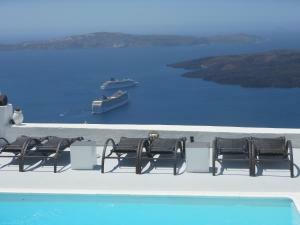 This apartment has a terrace with views of the caldera, a separate bedroom, a spacious living area and a bathroom. There are also apartments of 2 bedrooms. 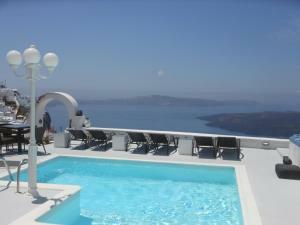 Studio consisting of a bedroom with a double bed, a bathroom and a private balcony or terrace with views of the volcano and the Aegean Sea. Suite with a bedroom with a double bed, a living room and a balcony with views of the Aegean Sea, the volcano and the romantic sunset. 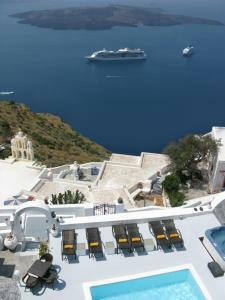 Its elegant decoration is ideal to spend the honeymoon. This studio offers views of the volcano or the Caldera and has a 1 bedroom, a seating area and a bathroom with a bath or shower.